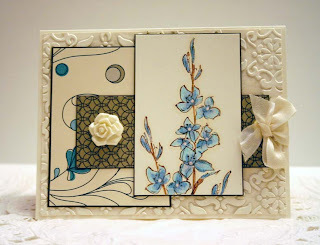 I stamped the Mixed Bunch flower all over white cardstock in Indigo and then ran through Lattice Squares embossing folder. Sprayed whole piece with Bahama Blue Glimmer Mist. 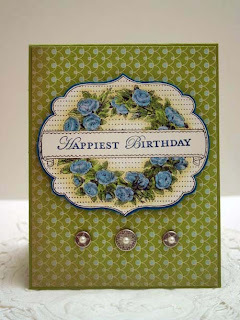 Used matching punch for main flower with a build-a-brad and sentiment from Create A Cupcake. 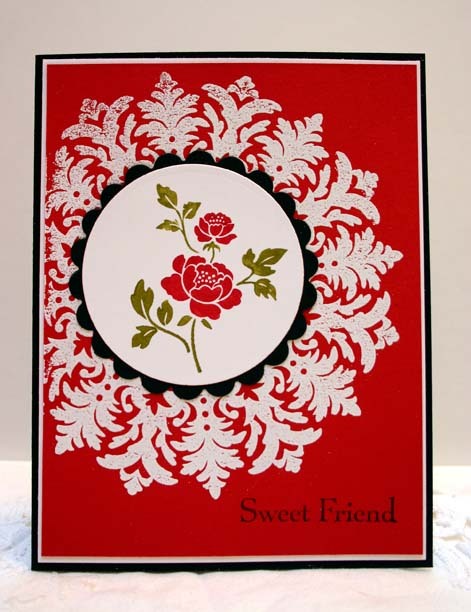 Supplies are Stampin' Up: Medallion embossed in white on Real Red. You Are Loved for flower and sentiment. All supplies are Stampin' Up: Elegant Soiree paper on a Very Vanilla base with Crumb Cake matting. Baja and vanilla seam binding ribbon and rose embellishment. Sentiment in Soft Suede is from the Create a Cupcake set. I love this birthday sentiment, my favorite from SU. It's a perfect size and font to fit almost any of the punches and labels. This card is a case of Toni (ravengirl), Queen for the Day on SCS. I tried to pick up the colors, flowers, and feel of this Attic Boutique paper. Apothecary Art stamp set, handmade rolled paper roses in Pool Party and Saffron with vanilla seam binding ribbon and ribbon roses all by Stampin' Up. Fern punch is Martha Stewart. 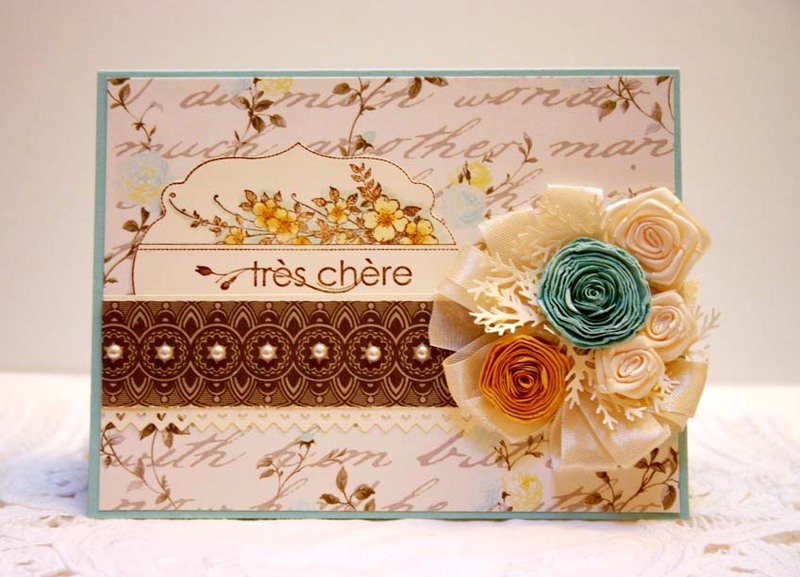 sentiment is from Chere Amie (French version of My Friend set by SU). 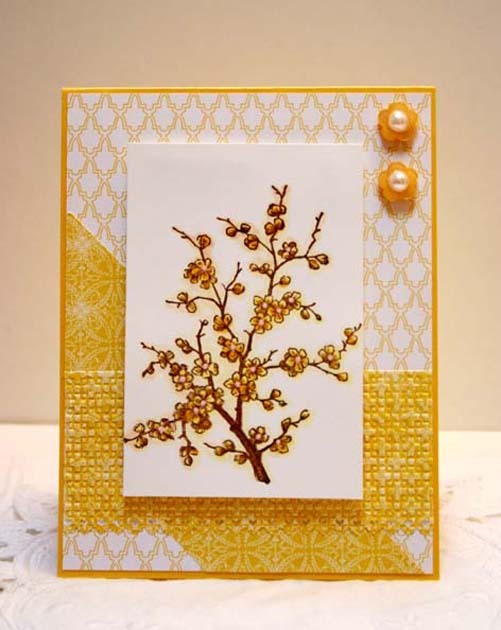 Attic Boutique paper, Daffodil and Whisper White cardstocks, Easter Blossoms stamp set and subtles buttons with half pearls. This is a lovely set that goes beyond Valentine's Day called You Are Loved by Stampin' Up. The designer paper is new from the Saleabration catalog that starts tomorrow. The SCS color challenge for this week is Poppy Parade, Lucky Limeade, and Basic Black. The dessert option is to use two different embossing folders, I chose Lattice Squares and Vintage Wallpaper. 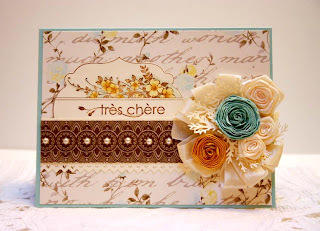 All supplies are Stampin' Up: Fast and Fabulous stamp set, vanilla cardstock, ribbon, and rose embellishment and retired SU designer paper Elegant Soiree. In honor of today's Featured Stamper Kim (luvflowers). This is in honor of my Queen for the Day friend Judy (jaydekay on SCS). 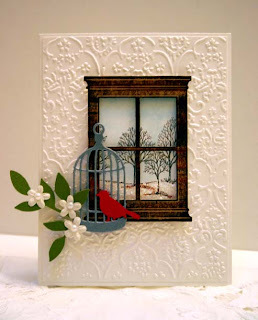 Memory Box window and bird cage die cuts, Martha Stewart bird punch, Cuttlebug ef, Lovely as a Tree stamp set by SU and branch die by SU, with some Dazzling Diamonds "snow". To make the wood look of the window I used my ink pads, swiping them on the cardstock going all in the same direction. First I used Sahara Sand, then Dusty Durango, finished with Soft Suede. So easy! 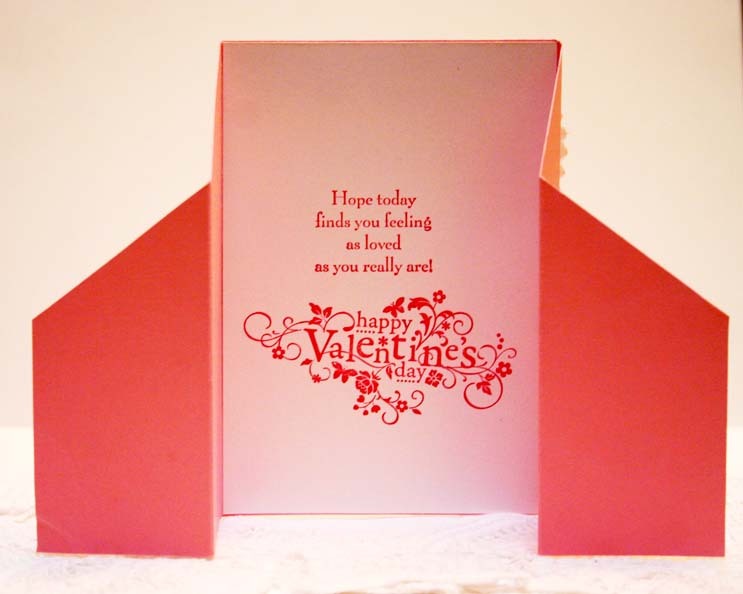 This valentine card has a stand type fold. Cardstock piece is 5 1/2" x 12". Score at 4" intervals so you have three panels. 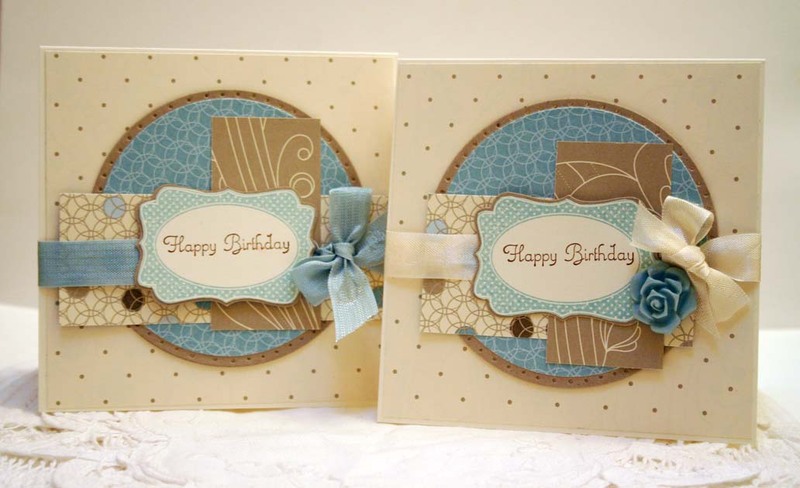 Make a mark on both ends of the cardstock at about 2 1/2" up and then at the very top of each center fold score. Draw a line to each dot and cut off this triangular piece on both sides. Score both end pieces in at about 2". 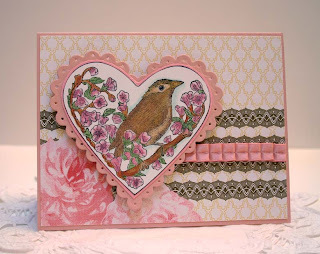 Pretty In Pink, Take It To Heart set with non SU sentiment. Love swirls wheel was clear embossed, heart buttons with pink twine to embellish. 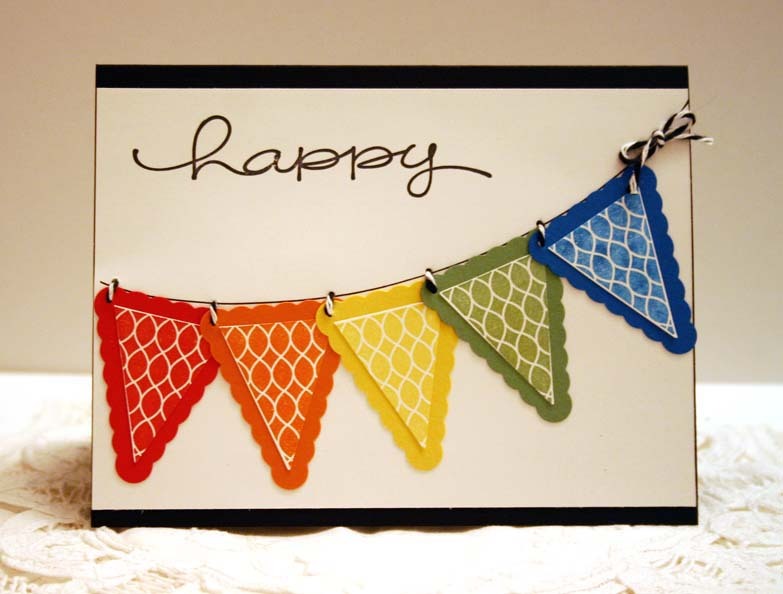 Stampin' Up's Pennant Parade (with matching punch) in Poppy, Pumpkin, Daffodil, Wasabi, and Pacific Point. 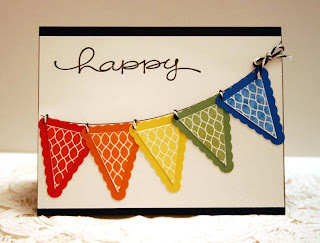 Happy Everything sentiment. Black and white twine stitched accents. 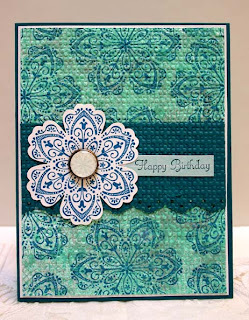 All supplies are Stampin' Up except for paper lace doilies on bottom of the band. 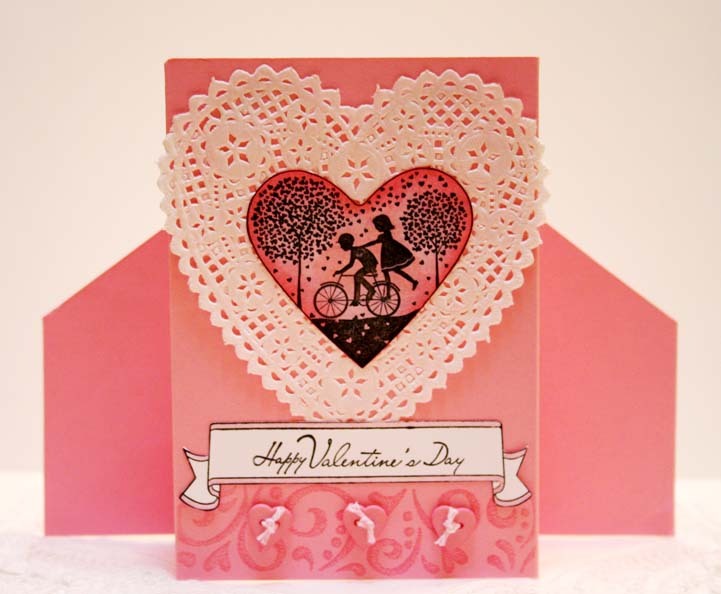 Retired SU paper, Fabulous Florets embossed in clear and white powders, You Are Loved sentiments on front and Happy Valentine's Day on inside, white taffeta ribbon and pink twine for stitches. 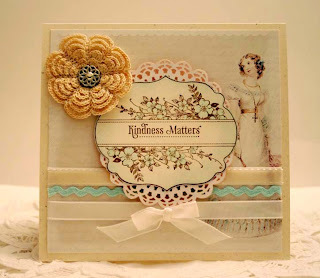 The base is Stampin' Up's Naturals Ivory with Apothecary Art stamp set, various ribbon including white taffeta, vanilla velvet, and Beachfront rick rack (retired). The recycled part is the vintage image which was from a package of Melissa Frances pearls. The crocheted flower is a vintage one from the 1940's with a filigree brad. 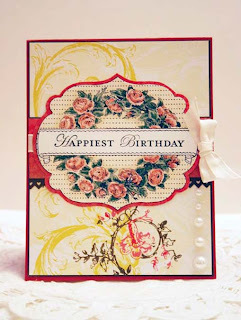 Apothecary Art stamp set and Attic Boutique paper by Stampin' Up. 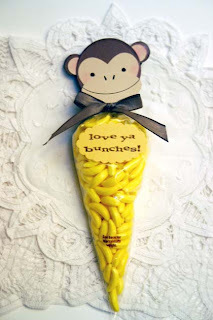 I got the monkey idea from Fiskar's website and made a few subtle changes, using various punches and die cuts. 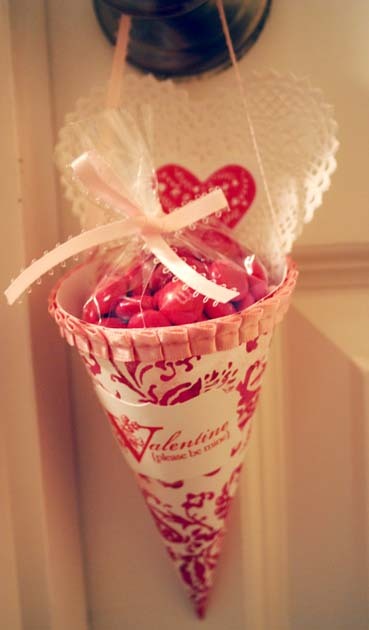 The candy was purchased at The Sweet Factory at the mall and already came in this cello bag. Sentiment is on Daffodil Delight cardstock in Soft Suede ink and uses Monkey Business set by Stampin' Up, taffeta chocolate chip ribbon to close. I love the old fashioned look of this paper, like a grandmom's wallpaper. All supplies are new SU: Atiic Boutique paper with Blushing Bride and Soft Suede cardstocks, Apothecary Art stamp and new ruffled ribbon. 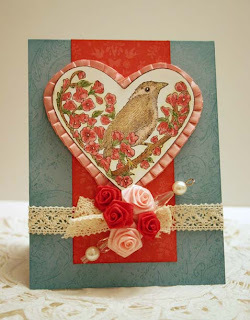 Build a Brads with some of the roses from the paper as embellishments. 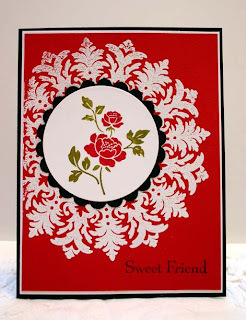 Inspired by Wedgewood china, I made this card using all Stampin' Up supplies. 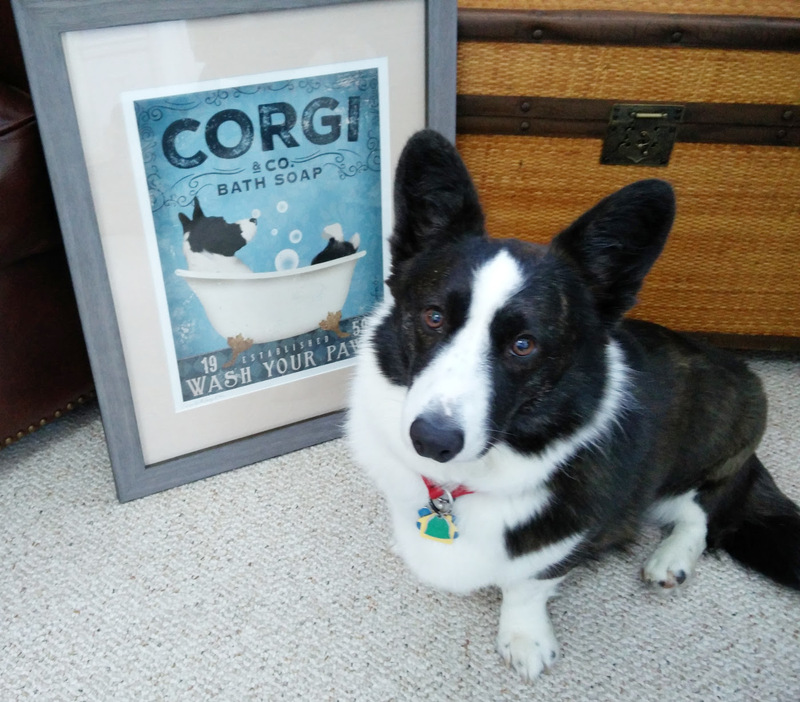 New Apothcary Art set with Baja Breeze (my current favorite) and Not Quite Navy cardstocks. The designer paper is a mix of old and new SU: base is a Christmas paper with some Beau Chateau and Domestic Goddess. I need to start thinking of flatter cards without a lot of embellishing since postage rates are going up again on the 22nd. 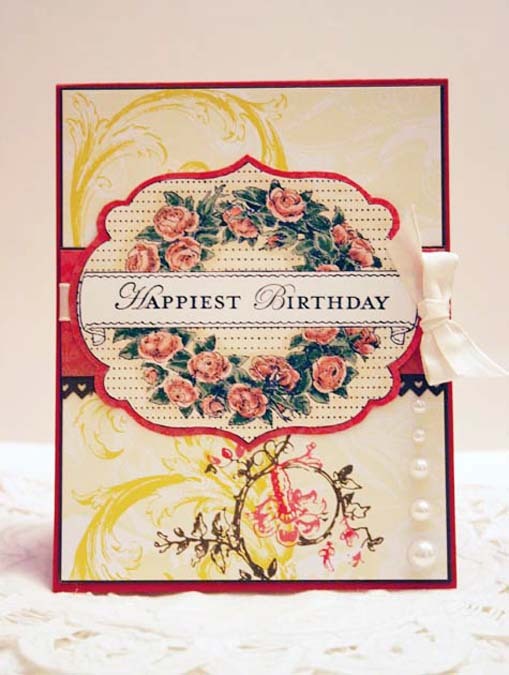 All supplies are Stampin' Up except for roses. Hope you can join us at SCS for this color challlenge that I am hosting this week. Blushing Bride, Riding Hood Red, and Baja Breeze. 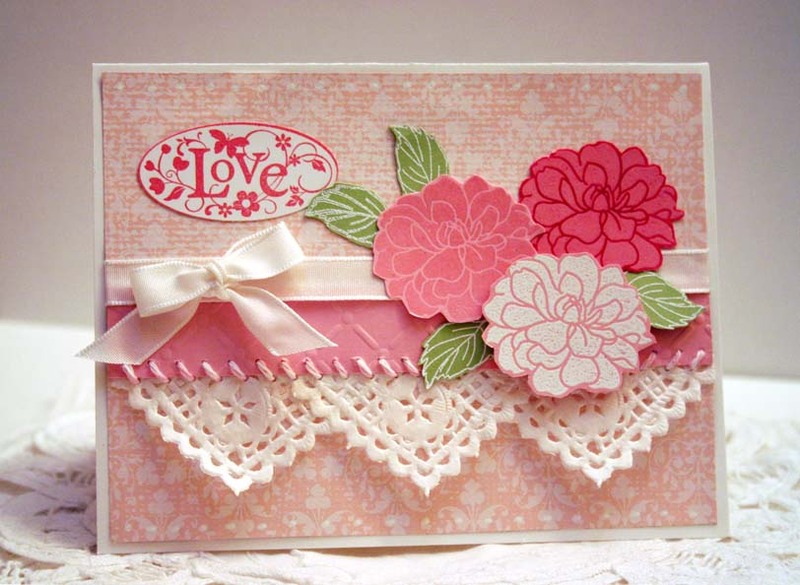 Take it to Heart set colored in markers with edging of new Blushing Bride ruffled ribbon. 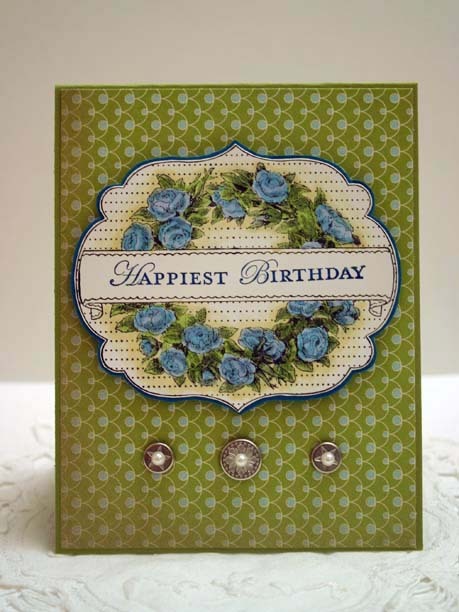 Baja Breeze card base is wheeled with Very Vintage jumbo wheel in matching ink. Paper is from the Saleabration catalog coming at the end of the month. 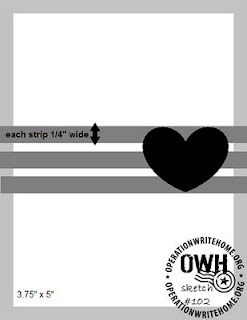 This quick and easy come template can be found at www.ruthannzaroff.com in the Templates section. I used a heavyweight designer paper for the cone, not sure who made this since it was loose on my desk. The ruffled ribbon is Blushing Bride by SU, the heart is from the new Take it to Heart set. Also used a heart doily and pale pink picot edge satin ribbon. Sentiment is from the retired SU Holiday Best set. Tip: I shop at the after Christmas sales for a lot of items that I can use for the upcoming stamping craft opportunities of Valentine's Day and St. Patrick's Day. The red and green M&M's can be perfectly divided for this, they stay good for quite a while. For today's SCS color challenge, this is a new set from the Occasions mini called Apothecary Art and the paper is a selection from the Saleabration catalog. 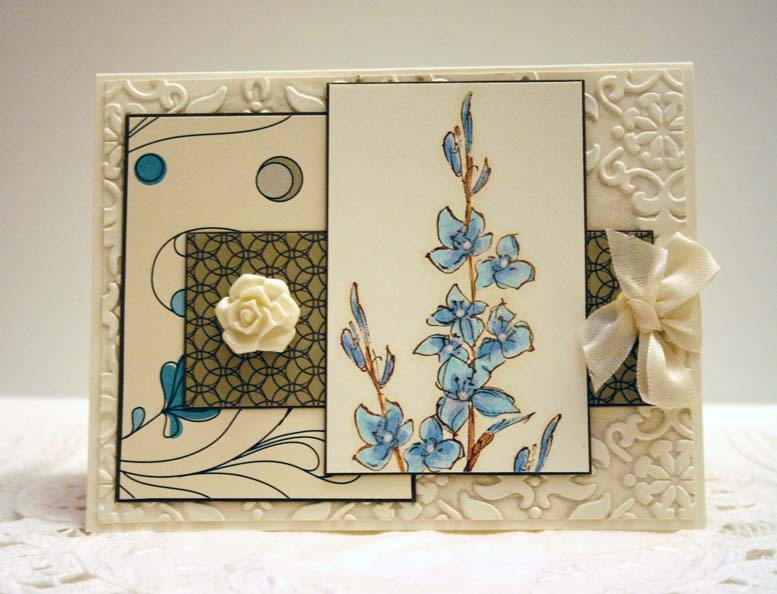 Lucky Limeade and Island Indigo cardstocks, image was stamped in Basic Gray ink and colored with markers. 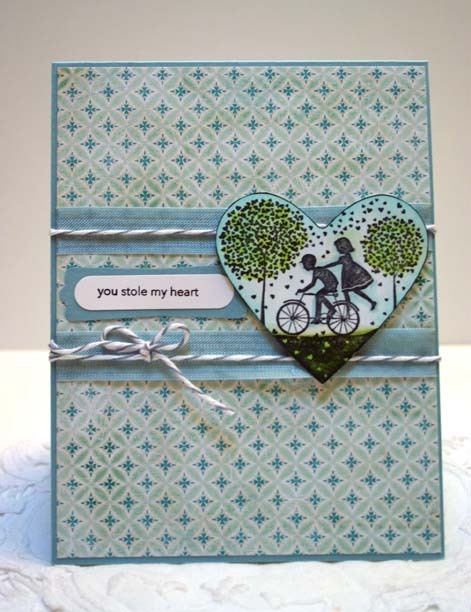 I used the new SU set Take it to heart for the silhouette image, Crate paper, Baja Breeze cardstock and seam binding ribbon. The sketch is from OWH this week. 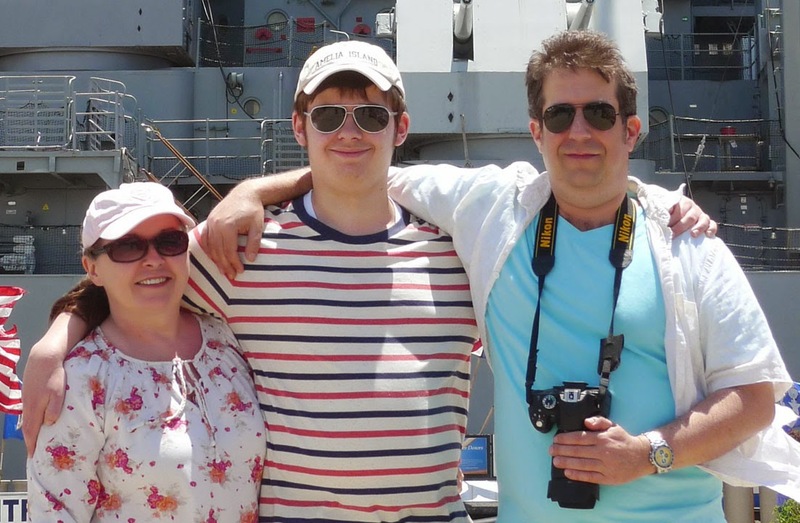 Play along, it's a fun and easy one! 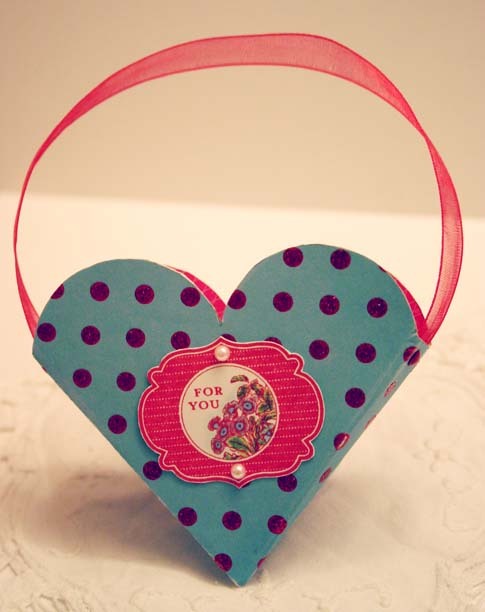 This cute little heart box was made with a template I found on the Internet from www.holyspiritinteractive), last year's SU Candy Cane designer paper, red organdy ribbon and the new SU set Apothecary Art. 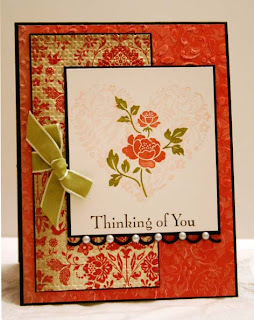 This is a new set from the Occasions mini called Take It To Heart with the new Attic Boutique paper. The Blushing Bride ruffled ribbon is one of my favorite new things. Love this stuff! keep an audio book going while I am crafting to catch up on my reading.